Monday was New Year’s Day, the only day of the year when all markets are closed. 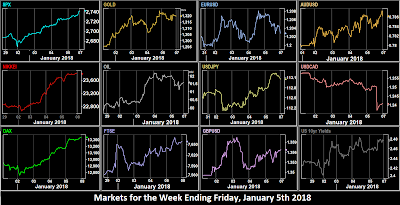 The New Year opened on Tuesday, and saw the SPX rally resume (and IXIC finally post a close above 7,000) after the PMI beat at 1445, although the reaction was not shared elsewhere. 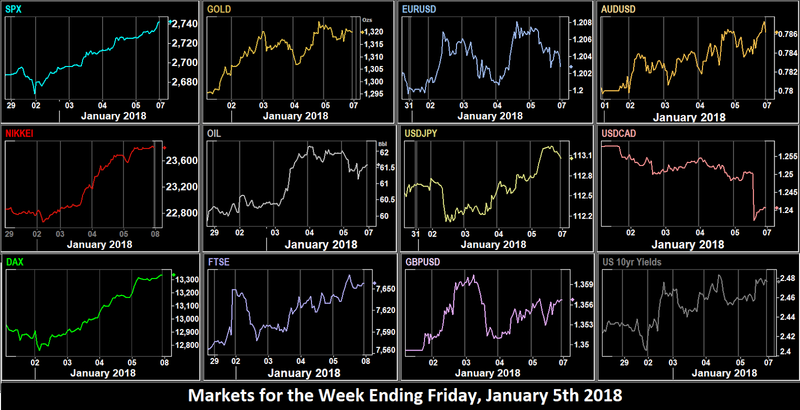 DAX and FTSE both suffered from an opening pullback as their respective currencies EUR and GBP soared (despite PMI misses in Germany and the UK), although FTSE briefly notched up a new all-time high at the open. A similar effect was seen in NKY (futures only - Japan was closed) but all closed lower. In currencies the theme was dollar weakness across the board, as EUR touched a four-month high. Gold fell in the Asian session, but was up 1.1% at the close to a three-month high, and Oil continued its December rally, touching a new 19-month high, although it ended the day flat. US 10-year bond yields were up on inflation expectations. Europe’s DAX and FTSE joined in the equities rally on Wednesday, helped by a turnaround in GBP and EUR which gave up Tuesday’s gains, and a beat in German Unemployment at 0900. SPX and NKY (futures - Japan closed again) continued to rally, both making new highs, all helped by the beats in ISM Manuf PMI and ISM Prices Paid, the latter being particularly strong at 69.0 vs 65.0. NDX, DJIA and SPX all posted new all-time highs. It was a rare positive day for the dollar, with DXY putting on 0.39%, both before and after the FOMC minutes. Only AUD (not part of DXY) was up. Gold was down in line, as were bond yields. Oil was sharply up (2.65%) on worries about the tensions in Iran, and correctly anticipating the API Oil stock beat at 2130. Another day, another all-time high. On Thursday DJIA broke straight through the psychological 25,000 barrier for the first time after the strong beat on ADP payrolls at 1315 (250k vs 190k estimate). NKY had already rallied on the first cash day of the year for Japan, and again DAX and FTSE joined in. The downward trend resumed in USD, with Gold and all other currencies rising against it. EUR was particularly strong (up 0.5%), making a new 4-month high, as was NZD, up 0.89% after the previous day’s positive milk auction report (which is published during the NZ night). Gold was up and yields were down. Oil held onto Wednesday’s gains with the EIA stock beat, posting a flat day. Friday started with another 100 points on NKY, and the mood continued with DAX rising as the Eurozone inflation report beat expectations. The big story of the day was of course the dual NFP print. The US missed (148k vs 189k), but the Canadian result was stellar at 79.5k vs downward revised estimate of 1k). This is equivalent to 715k in the US, as the USA has nine times the population of Canada. To top this, Canada beat on unemployment whereas the US figure came in as expected. You will remember that last week, we suggested a USDCAD move in short order to 1.2470. In the event, the pair smashed through this figure to drop 152 pips (1.22%) touching a 3-month low of 1.2355. The other US/Canada pairs, the Trade Balance and PMIs were both misses, and so had little effect on USDCAD. SPX and the other US indices shrugged off the NFP miss and accelerated even faster than earlier in the week to make another set of all-time highs. You would think it was a beat, as USD also did well, and despite the CAD blowout, DXY managed to post a small (0.16%) green candle for the day. (CAD is 9.1% of DXY), as the other DXY currencies were down, unlike non-components AUD and NZD which were up again. Gold was slightly down, and yields were slightly up, recovering to the Thursday intra-day high. Oil gave up a little of Wednesday’s ramp but was still comfortably up on the week. These are the prices movements for the week on the instruments we cover, with USD pulling back for a fourth week. With the contrast in the Canadian and US jobs reports, selling USDCAD was the best forex trade (or, again, Gold if you count that as forex). Indices were all very strong, with NKY being the best 4.56% up. Bitcoin recovered well, putting on 18.3% in the week. Over the weekend, President Trump is at Camp David with GOP leader McConnell and Speaker Ryan to plan this year’s legislative agenda. AG Sessions is not invited. Angela Merkel and her party are holding coalition talks with the SPD. There are two Fed speakers, Mester at 1515 Saturday and Williams at 1300 Sunday. Both are voters and slight hawks. We are back to normal now, and forex and futures open on Sunday evening at 2100 and 2300 as usual. Monday has several Eurozone forward sentiment indicators, and the BoC Business Outlook. With CAD at extremes, this is one to watch. More Fedspeak from Bostic (voter, neutral) at 1740, Williams (voter, hawkish) at 1835 and Rosengren (voter, hawkish) at 2100. Tuesday has the ECB non-MPC minutes. These are not normally important but are always marked as high volatility in case something unexpected is reported. Last time the euro was above 1.20, the ECB expressed concern. Look for similar remarks, which will surely drive EUR down. The Swedish inflation print is at 0825, SEK is 4.2% of DXY. Fed Kashkari (dove, non-voter) is speaking. Wednesday data is mostly in the UK. The trade numbers often beat or miss wildly, and so may move GBP briefly. Swedish Riksbank minutes are released (see comments for Tuesday). Fed Evans (dovish, non-voter) speaks at 1400. A quiet day. Thursday is a bit busier. The ECB MPC minutes are the main event. Traders will be looking for comments about the EUR level, and of course for further QE unwinding guidance. Remember the absence of comment can also move markets. Australian Retail Sales are expected at 0.4% vs 0.5% last month. A miss on this could put a roadblock on AUD’s recent recovery. Today’s Fed speaker is Dudley (voter, neutral) at 2030. Note that William Dudley is due to retire in mid-2018, so he may be a bit more forthright (as opposed to collegiate) this year. NZ Building Permits is the only significant New Zealand print this week, Traders are looking for an improvement on the very poor -9.6% last month. Friday has the most important data with both US inflation and Retail Sales at 1330. Remember that inflation is one part of the Fed’s dual mandate (along with employment), so the figure is theoretically as important as NFP. The estimate is 2.2% (1.8% ex Food and Energy), the same as last month. A miss could put the March hike (current estimate of likelihood 67%) in jeopardy and send USD down further. In Europe Bundesbank President Jens Weismann speaks, and voting concludes in the Czech Presidential election.